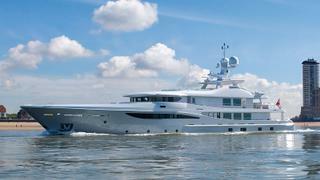 The 52.3 metre motor yacht Grace has been listed for sale by Imperial Yachts. Built in steel and aluminium by Dutch yard Amels to a design by Tim Heywood, Grace was delivered in 2009 as a Limited Edition 171 model and is Lloyds classed. Italian design duo Nuvolari Lenard developed a classic interior in wenge wood and dark leather panels accommodating 12 guests in six cabins comprising a full beam main deck master suite, VIP suite, two doubles and two twins. All cabins have entertainment centres, television screens and en suite bathroom facilities while the crew quarters sleep 12 members of staff aboard this yacht for sale. The expansive saloon has comfortable seating on settees and upholstered armchairs with glass topped coffee tables, bar and an entertainment centre. The adjacent dining area has formal seating for 12 guests and can be closed off for maximum privacy. Exterior areas are generous and include a large aft deck with al fresco dining options while a huge sun deck offers built-in seating areas, a dining table, sun loungers, a bar, Jacuzzi spa tub and sun pads along with a hard top giving protection from the sun. Twin 16V 2000 M70 MTU diesel engines allow a cruising speed of 13 knots topping out at 15.5 knots and she is fitted with Naiad zero speed stabilisers. The asking price of Grace is available on application.